With the heat and the rain, I have been able to harvest some of my produce. The radishes are gone, except for the few plants I let go to seed; the lettuce is finally ready and the peas are consumed as soon as they are ready. We did dig a hill of potatoes on the weekend, but we jumped the gun. The biggest was smaller in diameter than a toonie. As for my tomatoes, they are beginning to produce fruit. 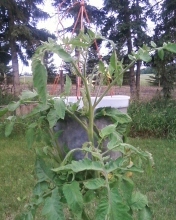 My upside down tomato is trying very hard to grow in an upright position. I'm not sure if that will change once it is heavy with fruit, but it definitely does not resemble the commercial upside down planters at all. Visit the Topsy Turvy site and you'll see what I mean. Personally I do not see it straightening out completely even if it does begin to produce a substantial amount of fruit. Does anyone agree? In addition to the garden starting to produce some fresh veggies, I picked a four liter bucket full of saskatoons yesterday. They are so good with cream and sugar! I had planned on picking more today, but the little bit of rain we got this morning was enough to keep me away from the trees. Our hay hasn't been cut yet, and I have to walk through it to get to the fruit trees. I did not have much desire to get soaking wet before I even made it to the trees. The berries are not as good quantity wise as they have been other years, but I will take what I can get. I love saskatoons! My sunflowers are starting to finally reach upward; it has taken them some time but it appears I may get some sunflowers after all this year. More food for the birds in the winter, provided the shells fill out. We had larger heads last year, but the shells were empty. I'm guessing they were not pollinated properly, which was a disappointment. I will soon be able to harvest the yellow beans, as they are blooming profusely. I overplanted as the seed was older, but apparently that has made no difference in seed germination. My lettuce on the other hand was an entirely different story; two plants from at least 50 seeds. Speaking of my garden, I do need to go out and pull some weeds. The heat and the rain have contributed to an explosion of them, even though I thought they were under control. The nice part about the raised beds is it is easier to weed. The moisture has also increased the mosquito population, so there will be a liberal application of bug repellent applied before I go out. Happy gardening and have a great day!